Immediately after the disaster the attention was directed naturally to first response (search and rescue operations/ retrieve of bodies) and relief. One may argue although that media have overshadowed these efforts by focusing its attention on Fukushima nuclear accident evolution and less on the people themselves. The channels were broadcasting endless footage of the Fukushima Daichii and Daini reactors with perhaps too little space allocated for news on the situation of the earthquake survivors. Nevertheless, this was the moment when social media raised as a powerful actor and often a reasonably reliable alternative source of information, to the mainstream channels for those involved in the relief operations as well as people trying to grasp what is the real situation. This initial stage didn’t gave space for much debate on anything as all efforts were directed to find fast feasible solutions to the most emergent problems such as finding survivors, finding appropriate shelters for evacuees, food and other emergency items, rebuilding vital infrastructure and communication and off course dealing with the nuclear accident. It should nevertheless not been understood that the actors involved were not looking to come up with ways to improve the emergency disaster system or simply just to improve their own situation. NGOs have created networks to improve communication and aid distribution from the first days after the earthquake. Such an example is Tonomagokoronet[i] , a Tono (Iwate prefecture) based local and national NGOs network that has been active in organising the relief efforts in Iwate. Also much smaller local based groups in less affected areas such as “Aid and volunteering in Tsukuba”[ii] and “Team Tsukuba” have contributed to the general relief efforts, bringing volunteers together, providing support to the City Hall in organising aid and donations for shelters and even dispatching volunteers to Tohoku. Whatever designed emergency system is in place it is influenced by the way actors work within or outside of its boundaries, actors that do not simply follow but also shape and reshape that system and even contest it when they consider that it has failed them. The mayor of Minamisoma is one such example of an actor that went beyond the system that he perceived to fail his community and asked for help in a highly unconventional way for Japan, using media to convey his message to the world. Now that Tohoku has moved to what commonly disaster management calls recovery and reconstruction stage, new or perhaps old but unaddressed questions and issues have arisen and most of them are related to Tohoku communities’ resilience or sustainability. Who are or should be the main actors that decide which are the best ways to rebuild? 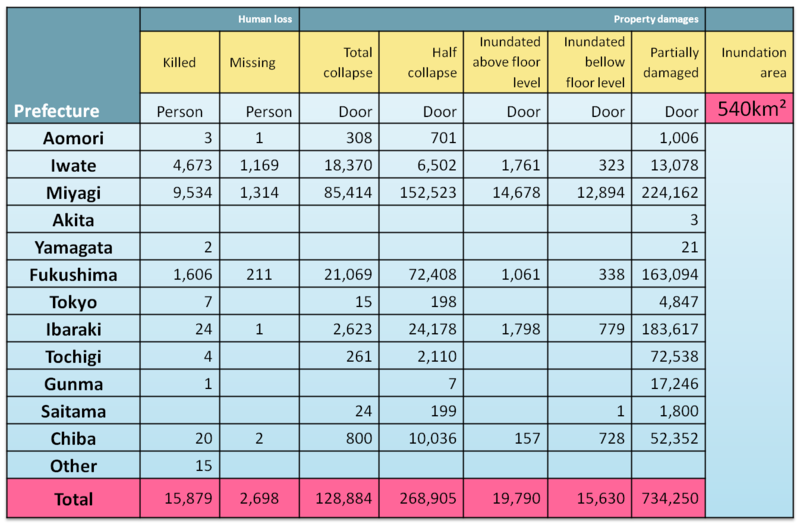 What and where to rebuild and for whom? Who speaks for the community? What should win over, a speedy recovery process which will maintain basically the same ante earthquake community structure and way of life, or a more lengthy and comprehensive process that deals not only with the rebuilding process but also with sustainability and the future of the region as a whole. Tohoku has proven to be such a place of interwoven and multiple discourses that are framing the recovery process and the community resilience. Each actor holds his own story of the truth and hopes to include it in the recovery plans. Negotiating recovery between these manifold discourses is sometimes a daunting process in Tohoku. The central government discourse strongly links the rebirth of Tohoku with a national rebirth. [iii] Tohoku is thus the foundation stone for a Japan that was struggling economically and in other social aspects way before the earthquake. Therefore, Tohoku recovery becomes the strategy to achieve a much bigger goal of national rebirth. (Goverment of Japan 2012). On the other hand the government trough its Ministers have published various reports in which Tohoku looks very well on its way to recovery. Once again a discourse build on statistics creates a different picture then the ground reality. “Adverse impact to Japanese economy is limited since the Pacific Ocean coast, which suffered the greatest damage, accounts for only 2.5 % of the total Japanese economy.””The affected areas are slightly smaller in economic size than that of the Great Hanshin-Awaji Earthquake (1995) (Ministry of Economy, Trade and Industry 2011, 2)”. While may be very well truth, it does not address much the economical precarious situation of over 100.000 evacuees from Fukushima. It also does not address the loss of small manufacturers or fishery and farming businesses. In addition, it is also interesting to notice a change in the government perception of the region. From a largely marginal, isolate and perhaps ignored region it became the hearth of Japan’s revival. Then it switches back to be marginal in a different context. The local governments are less focused in the statistics or a national revival and more in their own communities’ recovery as they need to answer to their own constituencies. While moving toward smaller units such as towns and villages various discourses unfold. On the one side the mayors must find a balance between their communities’ desire and the resources they can count on. The economic resources were very limited even before and the prefectural dept was extremely high making the communities in the aftermath of the earthquake depended of the central government financial support. In 2008 Iwate Prefectural dept % of expenditure reached 222.9 (Kage 2011) , with Fukushima and Myagi following closely. Moreover, the collection of taxes after earthquake it is not possible in many places since the businesses have been washed away by the Tsunami and people have lost their properties. While this definitely doesn’t strengthen the local government discourse in front of the central authorities there is no prove also that they don’t have the power of negotiating their position. Many of the local mayors have publicly voice their concerns. The mayor of Rikuzentakada (Iwate) has pushed for fast building of temporary houses, approval of reconstruction plans and financial assistance. Using social media he has started to post the progress of his city online instead of just discussing it with the officials. Virtually now most major towns in Tohoku have a web page, face book, twitter or blogs used to update on various issues from recovery progress, town meetings to festival and cultural events. Although the mayors are the elected representatives of their respective communities they are not speaking for all the members within. Again different realities and perceptions are building multiple discourses on the same event. The story of the 15 fishing villages of Onagawa is one such example. Onagawa lost to the Tsunami all its fishing villages. But with an average age of 49, Onagawa was slowly losing its fishing villages even before the earthquake. During the discussion of reconstruction plans within the Machizukuri Town Council [iv] in Onagawa, divergences between how recovery should take place have underlined even more complex issues inside the communities. The older generation opted for a rebuilding of all 15 communities based on the same settlements prior to earthquake while the younger generation and the mayor at that time were in favour of a merging of the fishing villages. Mr. Azumi, the mayor was replaced with Mr. Suda favourable to the rebuilding of all the 15 communities. “There were 15 locations, so there will be 15 locations.” (Onishi 2012). In the mean time young residents disagree but it is hard to make themselves heard and to express their opinion in public. Another divisive issue among the member of the communities in Tohoku was something that normally is beneficial, the distribution of aid and donations. B san[v] a long term volunteer in Tohoku and survivor of Kobe earthquake explained how the dynamics between the members of a community have been altered because of unequally aid support to the people affected. Inside communities after the earthquake, the donations have been a reason of a certain level of bitterness as some felt excluded compare to others. Media as an actor played a role due to its coverage on some areas in the detriment of other areas that were too small or isolate to make news. Then the general discourse have concentrate on the places with large losses of human life setting aside places that have suffered greatly despite their relative reduce number of deaths. Almost half of Iwanuma was flooded and it has suffered serious land subsidence (25% of the farm land are now bellow the sea level) but the perception is that media and the public has ignored them. Adding to that, issues connected with house insurances and compensations for the lost properties, businesses, family members of those who lost their lives during earthquake and for those who can’t return to their houses in Fukushima have further affected the communities and the relations among its members. Although resources are limited and one may argue that it should go toward the most difficult situations first, the perception of possible inequalities and formulating a discourse that include some while exclude others can only contribute negatively to community resilience and the creation of what the government has so strongly promote “kizuna” or bonds. Then in the case of displaced communities like in Tohoku finding commonalities with people that until the earthquake might have been outsiders is a difficult enterprise. How do you create the feeling of similarity between those who considered themselves different of the other? Thus reviving a community is not revolving only around place, infrastructure, and institutions but also around creating a base for restoration or creation of similarity. In some case it may be needed to create new communities from multiple former independent ones which is a complicate endeavour due to the fact it will be the result of and engineered and not a natural process. Seeing how all these discourses interweave with one another and how much of them can be found in the final recovery plans is important in order to figure out the relations and positions of all the actors and the direction the region is taking. The recovery process itself may gain a lot from the multitude of voices that grown after the earthquake. It is also truth that such diversity may delay the revival process but moving forward without a certain level of consensus and inclusions could prove more harmful in the long run. Finding again the internal harmony of the Tohoku communities or perhaps establish such harmony between all the actors could also put the founding stones for future resilient communities. [iii] In the road to recovery report from October 2012 by the Japan’s Government Japan’s overall rebirth is strongly linked with the reconstruction. [iv] Machizukuri citizen groups were used first time after the Kobe earthquake as a way to negotiate the reconstruction plans after strong criticism that the government acted unilaterally without consulting with the local residents. The Symbolic Construction of Communities. London and New York: A.P. Cohen/Ellis Horwood Limited, 1985. Goverment of Japan. “Road to Recovery.” Tokyo, 2012. Kage, Rieko. Comparing the Kobe and Tohoku-Pacific Coast Earthquakes. Michigan, 2011. Long, Norman. Development Sociology. Actors perspectives . London: Routledge, 2001. Ministry of Economy, Trade and Industry. “Economic Impact of the Great East Japan Earthquake and Current Status of Recovery.” Tokyo, 2011. Onishi, Norimitsu. “As Japan Works to Patch Itself Up, a Rift Between Generations Opens.” The New York Times, 22 February 2012: A8. Manoliu Cecilia is a second year PHD student in the Graduate School of Humanities and Social Sciences/ Doctoral Program of International Public Policy at University of Tsukuba, Japan. Her research interests are on community resilience, civil society and disaster management in Japan and Central Asia. Cecilia, thank you for that interesting report, which raised several important issues in the recovery, including the “generation gap” and the problem of an aging and declining population. I am especially interested in your discussion of the discord and contestation among various groups of actors. This reminds me of a presentation I recently attended in which a Professor Takagi from Fukushima University — at the moment I am unfortunately without my notes containing his full name — argued that while the ideal of the recovery has been “kizuna” (bond), the reality has been one of “bundan” (division, separation). He argues that this is especially true in Fukushima prefecture, where whole towns or neighborhoods have been cordoned off from public access, due to the seemingly arbitrary whims of the wind direction in the days following March 11, 2011. Because of this, the prefecture’s population is probably the most scattered of any of the other prefectures in the disaster zone. On top of that, there are those in the prefecture who were directly affected by the tsunami only, by radiation only, by neither, or by both. These differences further amplify the considerable diversity that already existed across one of Japan’s geographically largest prefectures. One question / comment for you. You quite rightfully describe different rhetorics coming from the national government, depending upon context. Certainly, from the perspective of displaced residents, these appear to be frustratingly inconsistent statements flowing from “the national government,” which demonstrate a consistent meta-discourse of protecting the government’s political interests regardless of fiscal or material realities. I would suggest that another way to view seemingly contradictory government-sourced statements is as indicative of diversity within the government itself, which after all comprises a small galaxy of ministries, agencies, and jurisdictions. By way of example, I recently met with officials of the national Reconstruction Agency at their Miyagi Prefecture office in Sendai. They complained about the difficulty they have had in securing funds from “the government” for projects related to radioactive contamination in those towns of far southern Miyagi Prefecture bordering Fukushima Prefecture, even though those towns are closer to the reactors than many parts of Fukushima Prefecture and suffered higher levels of radiation. So, here was a case of officials within a regional office of a national government agency who were clearly at odds with other parts of the government or even their own agency. And it should also be noted that Reconstruction Agency officials (numbering about 350 in total) are all “on loan from” other governmental agencies, including virtually all of the ministries. So they have quite a bit of internal diversity just within that one Agency, and one can imagine that this could create all kinds of opportunities for issues to arise with respect to philosophy, working style, etc. Anyway, what I want to say is that I think your analysis of diverse discourses is a fruitful approach, and that I believe that you can extend it even further by penetrating institutional facades and identifying the individual voices within institutional walls. I would love to see where it leads you. Thank you Tyson for your comment. I think you are right concerning the diversity of voices inside even one Agency . It is partially connected with the Japanese political system that is highly dependent of the bureaucracy. In fact the politicians might have an agenda but at the end of the day they must consult with the various bureaucrats from various Agencies who may change entirely that agenda. Hatoyama government and the Democratic Party tried to change this and shift the power more toward the politicians, but it was an unsuccessful endeavor and there are some who argue that this was his and his party downfall. Also, those bureaucrats working for an Agency or another may sometimes see only their projects and less the bigger picture. Each Agency wants to attract as much money as possible and to use it for their projects and priorities. The politicians do not have much power over this and are often unable to control it . Between agencies themselves is a competition for funds and even if one Agency does not necessary need the money they are never willing to redirect them toward another Agency that might make use of them. Since the Reconstruction Agency is new and the officials come in fact from other Agencies their opinion on how things should be run and what is a priority is also very diverse . Albeit I need to look more into it I think the officials tend to think based on their previous experience and find it hard to speak on one voice as officials for a new Agency. When it comes to kizuna and bundan and which one was more prevalent I think it’s important to consider time. At the beginning in the first faze of relief there was maybe “kizuna”. Probably not in the ideal imagined form but it was there. Most plans were short term and were focused on relief operations. There have been even then some divisive matters on issues such as shelter administration, donation distributions (especially on the issue of turning down items that are not enough for everyone in a place) but most people were willing to just set them aside until things get better. With time although, the conflicts developed over more complex problems and once the immediate danger was gone people were no more willing to set things aside. The case of Minami Soma I think is a good example. The Mayor had initially a hero status but now he is at odds with part of his community over the recovery process and the deaths of some of his administrative staff during earthquake. Your comment is very useful for me and I hope to be able to incorporate your suggestions in my thesis. Regarding the focus on discourse, I myself tend to regard discourse as a manifestation of specific value systems or political systems (perhaps this is naive), and thus an excellent window into society, but never a full description of it. Especially with disasters, I wonder whether the material suffering, and materiality more generally (radiation, food safety (4S/EASST meeting synopsis), civil engineering structures (from the SHOT meeting)) wind up anchoring discursive positions and discursive maneuvers in a direct way that also deserves scrutiny. It would seem that the evidence you cite deals with a kind of moral economy that pushes against the (mere) discursive constructs, especially of politicians who are playing to specific political interests. The ousting of the major in the fishing villages, and the pressure that the younger people in this region felt to remain silent, even thought they felt they had legitimate reasons to push for a more integrated reconstruction plan suggests that such forces may be at work. There’s also an interesting contrast here with the Indonesian disaster, where (from my understanding), foreign aid organization, working on concert with the central government, were much more freely able to impose a modernization agenda on the recovery process that wound up being a “second tsunami” that devastated the social order that had existed before the disaster. One thing that has been coming up in our discussions (at SHOT, 4S and elsewhere) is how we need to find way to talk across disasters. I’m very interested in seeing how you draw on the disaster studies literature so that we can start making valuable cross-comparisons. Your research topic is important and you raise relevant questions, such as who are main actors that decide which are the best ways to rebuild and who speaks for the community. I read an article on local peoples reactions to Chernobyl nuclear accident (Kuchinskaya 2011, in Public Understanding of Science). According to the article people who had experienced accident and serious losses did not have words to describe their feelings, emotions or losses. Therefore it came into my mind whether people in your study showed similar kinds of difficulties to express themselves after the catastrophe. Could it be that those who suffered most have not been able to speak on behalf of themselves? Have these people been marginalized? Thank you for your comment. I think some parallels can be made between Chernobyl and Fukushima but one must be very careful for the two situation are very different . I’m from East Europe (Romania) and Chernobyl has been quite a topic in our houses. I was very small child so my mother has been very anxious at that time especially because the lack of reliable information on what was going on there. But the contexts are very different. At that time East European countries were having communist governments and the information was much more limited. Except the soviets no one had much access to information on what exactly was happening there. The plant was administrate from Moscow so the Ukrainians didn’t have control over it. In term of anxiety due to lack of information and or false rumors there are some similarities. Evacuee from Fukushima have been scattered all over Japan in public houses when temporary houses were not available. Other have chose to move elsewhere in search for jobs. There is a lot of anxiety concerning their future and if they will be able to live again as a community . If you are not close to the location you were living before is very hard to express your concerns and keep yourself informed with the evolution of the situation. I think rumours and the focus on the radiation and less on the people has contribute to a certain level of discrimination. In some case even local authorities from different prefectures where the evacuees were sent have taken discriminatory measures lacking basic scientific information. As peculiar it may be, it happen even in a city where information is very easy to access. (For further reference please see this article :http://www.japanprobe.com/2011/04/21/city-apologizes-after-fukushima-evacuees-face-discrimination/). I prefer to avoid comparing Chernobyl with Fukushima because I do believe there are fundamental differences in the context, information access and dissemination, evacuation patterns, area evacuated, compensation, accident type etc. Thank you very much for your post. I’m sorry for the late reply. There are so many important questions raised. I’ll try to answer as much as possible to some of them maybe not in the same order although. I’m going first to your second question/comment on volunteer networks. I think there are some differences compare with other countries. I wouldn’t go up to the point to call it unique or exceptional but some things definitely work better for Japan than it will probably work somewhere else. From my own experience I think one is connected to the volunteer centres and their relation with the volunteers. There is a strong connection between the volunteers/city hall/ volunteer centres which I think is specific to Japan. (For this I think is important to look to the writings of R. Pekkanen, Akihiro Ogawa and Y. Tsujinaka on civil society in Japan) Most NGOs and individual/group volunteers work trough the volunteers centres (Nevertheless there were also NGOs working outside this framework but I would say they ended up being sometimes at odds either with the local authorities and even with local people. ). This relation requires a certain level of trust that has roots in Japan historical and cultural specific context. Such a relation is hard to establish for example during disasters in my country where basically the army become the main actor in organising evacuation/aid/temporary shelters/coordination etc which has roots in the country history. Then, the role of volunteers and NGOs is also different. There is a limited “migration” of volunteers toward disaster areas because there is the strong believe that the army is coming anyway (there are also issues with organising the volunteers, logistics a different history of civic engagement etc ). The entire managerial team of the General Inspectorate for Emergency Situations (GIES ) in Romania is formed by army officers that work best using an hierarchal military system where is hard to actually find a place for volunteers. The actors are quite different, the discourse is different the relationships between these actors is also different. Technology (including social media) has influenced recently the way volunteer networks organise themselves but I think the more “traditional” ways are more frequent at least among Japanese. If we refer to independent group of volunteers in the disaster areas in Tohoku they are mostly formed by people who knew each other previously. (ex. They are students in the same university, work colleagues, same ethnic background –Nikkei ) These networks are based on trust and ties that date back before the disaster. Social media was a channel (maybe worked more as a source of information but without more data to quantify I’m not sure it had a strong role in recruiting and establishing networks between volunteers especially Japanese) but not the only one. I think the neighbourhood association do make a particular case for Japan. The way these associations, small local NGOs and the big national NGOs connected to each other is perhaps specific to the Japanese cultural context. As for the “temporal transition from /kizuna/ to /bundan/ “ I’m still looking into it but I tend to believe is not necessary an unique cultural pattern . Perhaps using different words Quarantelli and Dynes in an article on Community conflict where pointing out that if there is to be a pattern fallowing a natural disaster is much more probably to have an absence of conflict in the emergency faze and a presence of one post –emergency. It became something “unique” only when the government started a campaign of “kizuna” and as time went by the word was so often used that lost its meaning or become very close to overlap with “wa”, harmony. Not having a harmony of voices does not translate necessary in an absence of “kizuna”. I find especially important your comment on “how we need to find a way to talk between disasters” particularly when the conditions are very different. In part my research is focused on that because I’m looking at case studies from Central Asia (mostly Kyrgyzstan) too. I think one of the manuscripts presented at this forum (Aid As Analogy: Ambiguities Of “Lessons Learned” In Post-Disaster Recovery, Chika Watanabe) also address this issue very well. In a place like Kyrgyzstan the discourse and the role of actors are different. The state is not the one who leads the projects because it lacks the financial means. While participation appear in most documents it is very difficult to determine how much of that participatory approach it actually happens in the aftermath of a disaster. International aid organisations have the financial resources in this case which change the situation and the discourses.